Pain threshold is different for every person and also it depends on the area getting treated. The pain is less than getting the tattoo. The treatment time is much quicker than receiving a tattoo. The feeling is similar to a rubber band flicking your skin or oil touching your skin while cooking. Detail Tattoo Removal Specialist will provide powerful topical anesthesia creams for anyone requiring pain control. This will mean the client must arrive 1-hour prior treatment or take the cream away with them after the consultation. With the advanced Syneron Candela Picoway Laser System the average number of treatments to achieve total clearance is between 6-8. After 10 treatments any additional treatments are no cost. Skin Type: The Fitzpatrick skin type rating scale from Type I skin to Type VI. This is basically from fair skin that burns and never tans to very dark skin that never burns and tans very easily. Location: As fractured tattoo pigments are being attacked by the body’s immune system the effectiveness of the immune system varies based on the body region. As the head and neck maintains the largest vascular supply, the immune system is the strongest in this area resulting very effective tattoo ink elimination. Then the upper and lower trunks are next then the extremities receive the last of vascular supply. This means tattoos on the hands and feet will take the longest time to have total tattoo clearance. Colours: Tattoo ink is made from a mixture of varying compounds. Professional inks are different to inks used by amateur tattoos. The colour of the pigment differs in the size of the granules. Black ink is the easiest to remove due to small size and lacks metallic elements and absorbs the laser wavelength. Red is the next easiest then green, yellow and orange. Amount of Ink: Increased intricacy of design also affects the tattoo. The 4 categories of ink are divided into: Amateur (letters, words or small symbols), Minimal (one colour, simple design), Moderate (one colour, complex design) and Significant (multicoloured, complex design). Scarring and Tissue Change: Tattoo placement can cause scarring which is an overproduction of collagen. This can encapsulate the ink and hinder the penetration of the cells of the immune system. This will result in lowered effectiveness of tattoo removal. Layering Tattoos: Many people decide to hide old tattoos by using new tattoos to perform a “cover up”. Since this requires layering of darker ink this means more treatments for tattoo removal. Individual’s Immune System: This is the hardest to identify. As each person’s immune system is determined by the state of health. This factor will determine how well your body will get rid of the ink. What is the Minimum Treatment Interval? Does Laser Tattoo Removal Cause a Scar? The older style lasers (CO2 lasers) essentially caused a burn that would disrupt the ink and cause an injury which resulted in a skin trauma. This would scab over and the ink essentially was ejected from the body with the scab. This method was effective but also produced severe scarring. Syneron Candela PicoWay employs the latest state of the art tattoo removal technology the fractures the ink into tiny particles that your body’s immune system eliminates. Our professionally trained certified clinicians carefully input the correct settings matching the skin type meaning you will get the results you expect with minimal chances of scarring. Unless the laser system is a picosecond or q-switched the laser is not designed for tattoo removal which means more chance of scarring. It must be stressed that the procedure is still employing the use of a powerful medical grade laser and the different types of inks are next to impossible to determine. If the operator isn’t trained correctly or if the operator uses settings that are too aggressive scarring can occur. Inks can react to the laser that may cause reactions to the skin. In less than 2% this can result in textural changes in the skin after healing. Our expert clinicians are certified skin therapist and their protocol is based on “best practice”. This means the clinicians care about skin integrity as much as removing the tattoo. On large tattoos a patch test will be implemented with a follow up in 2 days to determine if there are any reactions. What you will see during treatment is the tattoo developing a white frosted crust. Redness and some swelling will occur. Some blistering may occur as this is the body’s natural healing process but it is rare. At Detail Tattoo Removal a gel wound dressing is applicated post treatment and Bepanthen is applied to ensure rapid healing. Can I Get Part of the Tattoo Removed? The Picoway laser system has the following spot sizes: 2,3,4,5,6,7,8,9 & 10mm. With the smaller spot sizes we are able to treat tattoos with a high degree of precision as well as just treating the areas of the tattoo you want to remove and avoid the parts you want to keep. All our clinicians are expertly trained certified skin therapists. Each clinician undergoes extensive training in the operation of the laser systems and performs many hours of clinical training. The advantage of having a certified skin therapists is they understand the science of the skin and how skin reacts to lasers. Certified skin therapists can assess each patients suitability and provide the most accurate treatment protocol. Do You Treat Cosmetic Tattoo? In the past, nanosecond laser systems were advised not to be used on cosmetic tattoos as the heat of the laser could cause the tattoo to be darkness so the results were unpredictable. The Picoway laser system uses photoacoustic energy rather then photothermal energy. This means the power of the picosecond laser is able to shatter even cosmetic tattoo ink. It is highly effect for this purpose as cosmetic tattoos are normally applied on the surface of the dermal layer. How soon can I treatment after I just had a tattoo inked? PicoWay: As PicoWay operates in the photo-acoustic parameters you can treat your new tattoo after 2 to 3 weeks after getting the tattoo and the skin is completely. Can I Tattoo Over the Same Area I Have Just Treated? Once the skin is healed completely you are able to tattoo over the same area. Many of our patients want to remove a old design to allow their new artist to create their new artwork. We are able to return your skin to a new “canvas” to get the tattoo you have been dreaming of. Laser therapy uses non-ionising radiation in the form of a concentrated light source that produces a very fine laser beam. Laser therapy does not use the same ultraviolet (UV) wavelengths as those found in sunlight (i.e. UVA and UVB), which are known to damage the DNA in cells and cause skin cancer. Non-ionising radiation is also different to ionising radiation (e.g. nuclear radiation, X-rays), which is also known to cause cancer. There hasn’t been any clinical linkage in the use of laser to cause any cancer in the 40 years of laser therapy. 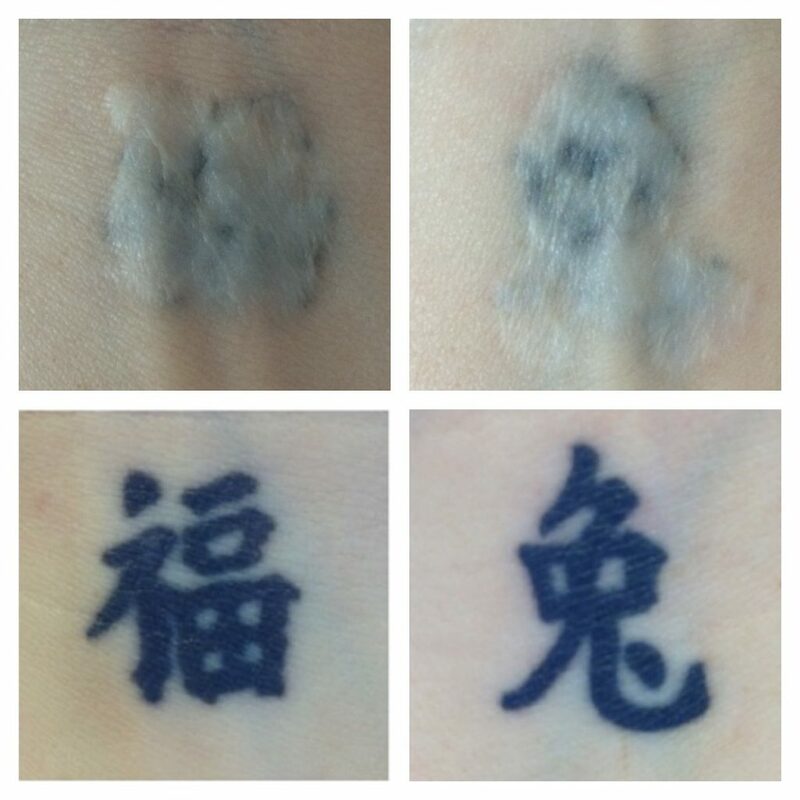 Are There Any Conditions That Prevent Laser Tattoo Removal As Suitable Treatment? Recently tanned skinned cannot be treated. A client must avoid sun for 2 weeks. Otherwise blisters and hyper (dark skin)/hypo (light skin)-pigmentation may occur. Fake tan must be discontinued for a week prior treatment. Infected or acne break out area must be avoided. Wait 6 months after Accutane therapy. History of photosensitivity to infrared light. Medications and Supplements: Daily anti-coagulation therapy, iron supplements, herbal supplements such as ginkgo, ginseng or garlic and fish oil supplements may bruise more readily. Photosensitizing Medications: Medications that induce photosensitivity or medications in or around the 532, 755 and 1064nm wavelengths range. Stop the medication if possible for 3-5 days prior to treatment. Why is PicoWay the Gold Standard in Laser Tattoo Removal? PicoWay is the fastest Picosecond Laser System on the market. PicoWay 450ps vs Picosure 750ps. Faster means less thermal damage to the skin and creates a true photoacoustic shock wave. PicoWay has the highest peak power of picosecond laser system. PicoWay 0.9 gw vs Picosure 0.36gw. This means the peak power of the PicoWay is 4.5 times more than Picosure. The photoacoustic shock wave shatters the ink into the tiniest particles for the immune system to remove the pigment. This allows the immune system to process the ink through the body. PicoWay has 2 wavelengths of 1064nm & 532 nm while Picosure has only 1 wavelength 755nm. PicoWay can treat all colours and skin types. Picosure can only treat black and can not treat darker skin types safely. All these factors mean you can have tattoo clearance within 4 to 6 months. The PicoWay is the gold standard for tattoo removal in Sydney, click here to book a free one-on-one consultation today. Skin Graft: This technique is the oldest and while effective in removing the tattoo this leaves a very noticeable scar. A incision is made and the skin with the tattoo is removed and the skin is sewn up. Sometimes, skin from other parts of the body is used is there isn’t enough skin, you then end up with 2 scars. Dermabrasion: This technique is effective as the skin is sanded away along with the tattoo pigment. The skin is left raw and healing takes months with a noticeable scar or at the least textural change. Apart from these medical procedures the only other method approved by the FDA is Q-Switched and Picosecond laser Systems. IPL or Laser Systems Not Designed for Tattoo Removal: IPL is Intensed Pulsed Light and this technology doesn’t have the power to shatter the ink pigments. IPL’s main use is to heat the skin to stimulate rejuvenation. IPL isn’t a laser and it doesn’t penetrate into the dermal layer. Only Q-Switched and Picosecond laser systems have been approved by the FDA to remove tattoos as they are fastest enough and powerful enough to remove tattoos effectively. There are many lasers systems on the market that are effective for hair removal and skin rejuvenation while may fade the ink somewhat they will not remove tattoo completely. Lasers come in many levels of power and wavelengths. Ranging from laser pointers to industrial lasers to cut metal. Therefore, only a precision laser system that has been designed for it specific task like shattering ink can achieve the specific outcome. A good indicator is if the laser system is plugged in with a domestic household power point then the laser will not have enough power to treat tattoos. All tattoo removal lasers use industrial size 32amp power points. Acid Injection: This technique requires the epidermal layer of the skin removed while injecting TCA, lactic or glycol acid into the tattoo with a needle or tattoo gun. The ink reacts to the acid and causes a scab where the ink comes off with the scab. This method is very risky as the acids are injected deep into the dermal layer and the skin reactions are unpredictable and normally very painful. Major scarring occurs and not all the ink comes out and makes laser removal even harder as scar tissue surrounds the remaining ink. Do-It-Yourself-Creams: These creams are applied to the skin and are suppose to absorb through the skin to the ink and bleach the ink. This is difficult for a cream to penetrate the epidermal layer to get to the dermal layer where the ink rests. As well if this was true the cream would bleach all pigment in the skin including your natural pigment thereby leaving white patches on your skin. Some claim to cause white blood cells to attack the pigment ink. If this was the case the pigment is still too large for your waste system to process the pigment. These creams make big claims and while they may not do much damage they will not produce much results.